Scalp micropigmentation (SMP) at Jacksonville Hair Restoration Center is a non-surgical hair loss solution for patients experiencing pattern baldness, thinning, and receding hairlines. Scalp micropigmentation utilizes specialized technology to transfer pigments to the scalp. These pigments are made to look exactly like your natural hair follicles, allowing our Jacksonville hair doctors to recreate a fuller, thicker-looking head of hair! Scalp micropigmentation patients can achieve natural-looking improvements to their hairlines without the need for extensive surgeries, unsightly incisions, or lengthy downtimes. Our scalp micropigmentation specialists at Jacksonville Hair Restoration Center can customize SMP treatments to best fit your procedure goals. Scalp micropigmentation replicates the appearance of your own hair follicles by adding pigmentation to your scalp. The SMP device can transfer pigments with extreme precision and accuracy. Your scalp micropigmentation specialist can replicate thousands of follicles to fill in thinning areas and enhance your hairline. How can scalp micropigmentation improve the appearance of my hairline? Male and female pattern baldness can lead to thinning hair over time. Many men lose hair at the top of the hairline, as well as at the crown and temples. Women usually experience thinning at the top and crown of the scalp. As hair begins to thin, bald patches start to become more prominent and can take away from your natural hairline. Your scalp micropigmentation doctor will carefully fill in areas of thinning hair or missing follicles using the SMP device. Every hairline is different; your SMP treatment can be customized to best fit the shape and contour of your natural hairline. Our Jacksonville hair doctors can match your natural hair color and use scalp micropigmentation to blend into your natural hair, giving the appearance of a fuller head of shaved or short-cropped hair. Straighter hairlines or curved hairlines can be created, depending on your preferences. 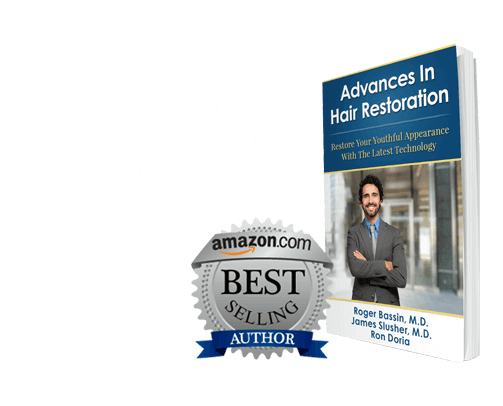 Our hair doctors will work with you to create a follicle replication treatment plan that can best achieve your desired results. What can I expect during my scalp micropigmentation treatment in Florida? Since scalp micropigmentation is a form of non-surgical hair restoration, SMP patients do not need to undergo extensive preparations beforehand. There is no general anesthesia required during your scalp micropigmentation treatment. Instead, a topical anesthetic is used to reduce any discomfort that may occur during your SMP procedure for hair loss. Scalp micropigmentation is typically completed in sessions. During your first treatment, a lighter shade of pigmentation is implanted to lay a foundation for your new look. Subsequent scalp micropigmentation sessions will further fill in your hairline and add darker shades to your scalp, resulting in a thicker-looking hairline. What can I expect after undergoing scalp micropigmentation treatment? Scalp micropigmentation patients can resume their daily activities immediately following their follicle replication treatment. You may experience slight redness around the scalp, which typically dissipates after a few days. Scalp micropigmentation patients are advised to avoid sweating, as well as rinsing, scrubbing, or shaving the head for about a week to allow for optimal healing. SMP treatment can yield improvements to your hairline that last years. Additional touchups are required to maintain your scalp micropigmentation results. How do I get started with scalp micropigmentation In Jacksonville? The doctors and staff at Jacksonville Hair Restoration Center would be happy to help you set up a private consultation to discuss scalp micropigmentation. Schedule an appointment online or call our Florida location @ 904.996.0030.